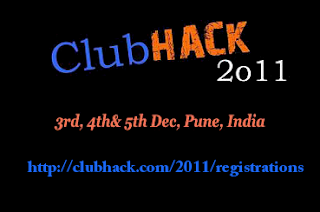 Team ClubHack brings the 5th edition of ClubHack Hacking and Security Conference with more exciting activities. With the motto – "Making Security a Common Sense" in mind 5th edition of ClubHack has series exciting events to keep you abreast with latest developments, issues and concerns in the field of security. This is one of the most affordable, time-efficient and resourceful ways to stay connected with the exhilarating field of hacking and security. ClubHack 2011 is mainly focusing on latest trends like Facebook & Android which are most vulnerable to external threats and breaching. Facebook has now become a popular social network & Internet feature in India. It is seen that people don’t hesitate to share their personal info & pictures. Also facebook allows external applications to execute on facebook & consequently on our system. Each time facebook users provide personal info to access such applications. Likewise facebook have many loopholes which can disclose your every information on web. Recently it is said that 2 lakhs facebook accounts hacked in Bangalore in this way. Android is the most popular phone operating system right now which is slowly gaining fast acceptance even in corporate world. With the increase in popularity, many kinds of malicious apps have also crept in into the android market, doing data theft or stealing your personal information. Without getting physical access to phone, personal data can be stolen. At ClubHack you will see demo of Android Hacking and Forensics and also how to secure Android Phones. At ClubHack, in the workshop "How Professional Hackers Hack" the renowned trainer "Vivek Ramachandran" will demonstrate how the actual attacks take place even if all the guidelines are followed such as putting Antivirus, installing firewall, patching system et al. Trainer will also teach how to hack from e-mails, Breaking into Enterprises using Client side attacks, Advanced wireless attacks, Write hacking codes, website attacks and many more interesting hacks. "Hacker vs. Developer" is a workshop designed specially for software developers and will be delivered by famous trainers "Akash Mahajan & K V Prashant". Here you will learn how hackers exploit software vulnerabilities and how to secure these softwares during the development cycle itself and what are the best practices of securing code. This workshop will put emphasis on security in all the steps of SDLC. Highly Technical Conference with 2 days of Technical Briefing and 1 day of hands-on training workshop. Specialized hands-on training workshop for Network Admins, Developers, Researchers, Architects, Govt. Agencies, Auditors, Students. Cloud based Capture-the-Flag, 1st time in India. Education. Meet the Who's-Who from the industry, Geeks and Nerds, Entrepreneurs and learn from them. Multiple lead generations from opportunities from corporate and Govt. Business development and Partner Recruitment. Meet with other vendors as well as open source projects to generate business development and product innovation opportunities. Staff/Hiring. Recruit from the industries brightest including internship opportunities with students. How to download files using torrent client?